In this paper, the results of the investigation about the figure of the spectator before a creative work are showed. A review of the state of the art was carried out by reading several authors who have addressed the issue of the viewer, even incidentally. This initial analysis led us to think that there are not enough attempts to define neither the viewer nor its field of action when interacting with a creative work. Consequently, we believe that there is not enough up-to-date scientific literature on the specific concept of the spectator. Thus, the goal of the research showed in this paper was to define the viewer and his links with the creative work. Documentary review, critical reflection, and confrontation of concepts were used as a research approach. The first result was a definition of the spectator: The person who finds a break in the routine through confrontation with a creative work. This encounter can be accidental, or it can be caused by the same spectator. From this contact with the work, it is essential that the person interacts with this expression. Likewise, stemming from the above, the person can obtain ludic, aesthetic or cultural stimuli. In the same way, we propose 13 functions that, in our opinion, all spectators perform: 1. Searching, 2. Creating expectations, 3. Contemplating, 4. Judging, 5. Questioning, 6. Believing, 7. Disbelieving, 8. Discriminating, 9. Criticizing, 10. Flattering, 11. Vilifying, 12. Accepting, 13. Rejecting. Likewise, we think that the spectator only assumes himself as such, when he has exceeded a certain level of knowledge about certain types of works, genres, or authors. Jia, A., Shen, S., Epema, D. y Iosup, A. (2016). When game becomes life: The creators and spectators of online game replays and live streaming. ACM Trans. Multimedia Comput. Commun. 12(4). Alcolea, J. (2009). Visual Arguments in Film. Argumentation, 23(2), 259–275. Andersen, K. (2005). Harry Potter and the Susceptible Child Audience. CLCWeb, 7(2), 2-10. Aumont, J. (1992). La imagen. Madrid, España: Paidós. Babatunde, B. y Simmons, R. (2007). A tale of two audiences: spectators, television viewers and outcome uncertainty in Spanish football. Journal of economics and business, 61(4), 326-338. Cerezo Arriaza, M. (1996). La televisión: del espectador ingenuo al espectador crítico. Revista Comunicar, (6), 15-21. Chabot, K. (2008). Audience, Sentimental Postmodernism, and Kiss of the Spider Woman. CLCWeb: Comparative Literature and Culture, 10(3). Contreras, F. y Gasca, L. (2016). Las emociones del espectador en una experiencia fotográfica, pictórica y cinematográfica. Praxis y Saber, 7(14), 165-192. De Souza Barros, M. (2015). Luzes sobre o Espectador: artistas e docentes em ação. Rev. Bras. Estud. Presença, 5(2), 330-355. Díaz, V. (2012). Espectadores de falsos documentales. Los falsos documentales en la sociedad de la información. Athenea Digital, 12(3), 153-162. Kirkkopelto, E. (2011). I am a Child. Hypothesis on Spectator Pedagogy. Ethics in Progress Quarterly (ethicsinprogress.org), 2(2), 81-87. Happer, C. y Philo, G. (2013). The role of the media in the construction of public belief and social change. Journal of Social and Political Psychology, 1(1), 321-336. Heddon, D., Iball, H., y Zerihan, R. (2012). Come closer: confessions of intimate spectators in one to one performance. Contemporary Theatre Review, 22 (1). 121-134. Hernández, B. y Martín, J.L. (1998). La recepción de la obra de arte y la participación del espectador en las propuestas artísticas contemporáneas. Revista Española de Investigaciones Sociológicas, (84), 45-63. Lauwrens, J. (2012). Can you see what I mean? An exploration of the limits of vision in anti-ocularcentric contemporary art. De arte, (85), 26-41. Liebers, N. y Schramm, H. (2017). Friends in books: The influence of character attributes and the reading experience on parasocial relationships and romances. Poetics, 65, 12-23. Loscertales, F. y Núñez, T. (2008). Ver cine en TV: una ventana a la socialización familiar. Comunicar, XVI(31), 137-143. Lopes, F. y Loureiro, L. (2011). My Newscast Is No Longer Ours. Journalism and Mass Communication, 1(3), 201-212. Massara, G., Sabeckis, C. y Vallazza, E. (2018). Tendencias en el cine expandido contemporáneo. Cuadernos del centro de estudios en diseño y comunicación. Ensayos, (66), 157-172. Moreno, M. (2006). 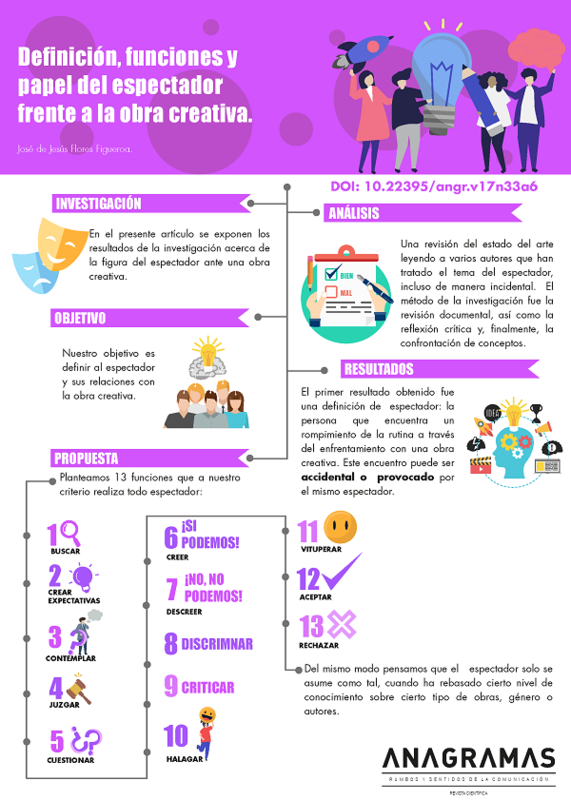 Educar espectadores: propuestas expositivas y dinamización. Comunicar, (28), 211-228. Niven, Larry. (1987). Los ingenieros del mundo anillo. Ciudad de México: Ediciones Roca, S.A.
O’Neill, B., Gallego, J. I. y Zeller, F. (2013). New perspectives on audience activity: ‘prosumption’ and media activism as audience practices. En N. Carpentier, K. Schrøder. y L. Hallett (eds. ), Audience Transformations: Shifting Audience Positions in Late Modernity (pp.157-171). Londres: Routledge. Pimentel, L. A. (2010). El relato en perspectiva. Estudio de teoría narrativa. Ciudad de México: Siglo XXI Editores. Prósper, J. (2013). El sistema de continuidad: montaje y causalidad. Historia y Comunicación Social, 18(1), 377-386. Rincón, O. (2008). No más audiencias, todos devenimos en productores. Comunicar, 15(30), 93-98. Roldán, C. (2010). El actor y el espectador. De freud a Lacan. Revista Affectio Societatis, 7(13). Sánchez‐Escalonilla, A. (2013). Verisimilitude and Film Story: the links between Screenwriter, Character and Spectator. Comunication & Society, 26(2), 79‐94. Scott, S. (2017). Modeling the Marvel everyfan: Agent Coulson and/as transmedia fanculture. Palabra Clave, 20(4), 1042-1072. DOI: 10.5294/pacla.2017.20.4.8. Torrente, P. (2015). La sutura de lo ausente. El espectador como actor en el videoarte. Cuaderno, 52,19-29. Total or partial reproduction of the contents of the journal are authorized for educational, investigative or academic purposes as long as the source is cited. In order to make reproductions for other purposes, it is necessary to have the express authorization of the imprint or Sello Editorial of the Universidad de Medellín.